Here is a welcoming sunny yellow room from this blog. Decorative dishes and plates in yellow would fit right into this inviting space. Decorative dishes and plates could be used in the niches, on the cool glass tables or right on the yellow wall. Love it! 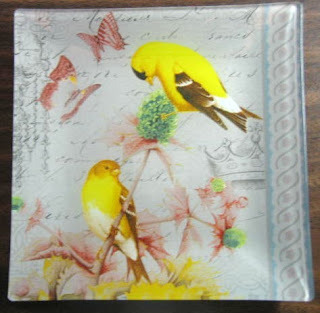 Here's a cool paisley square decorative plate and below is a glass decorative plate featuring yellow birds.